If you are itching to know what comes between MP-22 Ultra Magnus and MP-24 Star Saber, Taghobby has the answer in a newly revealed Masterpiece MP-23 Exhaust. Being a Decepticon, Exhaust is a redeco of the upcoming MP-20 Wheeljack with a new head. 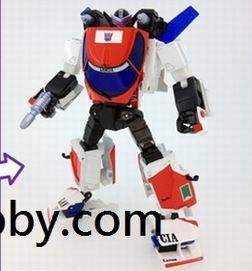 The figure also seems to come two new shoulder rocket launchers and the Wheeljack Instant Immobilizer. The deco is based on a Diaclone retool of the toy that would one day become Wheeljack. It has also come to be known as Marlboor Wheeljack by most fans. Paint app on the car mode is great (missing the most important brand on there for obvious reason). The colors just don't look good on robot's mode. Head's proportion is a little off IMO. Was wondering who MP-23 would be with Ultra Magnus being MP-22 and Star Saber now confirmed to be MP-24. "EXHAUST" is a hilarious name for Marlboro wheeljack. Absolutely awesome. Can't believe they are doing this and that it is not an exclusive. Hahaha amen! He HAS to be Marlboor! This is effin' bizarre, I'm loving it!! A new character "Exhaust" was added to the popular sports car line among TF foremost series "Masterpiece." It is the first time to commercialize Decepticon army in sports car line. Racing car from the world popular "Lancia Stratos Turbo" transforms into a robot. Vehiclemode obtained Fiat company's legitimate license. Parts such as in the head and missile are new formative parts. Wheeljack's famous invention "Immobilizer" is included. Contents: Exhaust (1) missile (2) handgun (1) Immobilizer (1) Instruction (1)"
Point (left): The vehicle mode has acquired the legitimate license of "Lancia Stratos mode." Point (below): Red line was adopted on the head of new formative parts like the other enemy character. Point (below): Wheeljack-invented "Immobilizer" is included. " Hm, why is this getting a new number? Sunstorm and Tigertrack didn't. I hope it doesn't mean that the MP line will lose its way after Magnus. Exhaust is just glorious. I might even get him. I can't believe it, even the new head is correct. But WHY put any Decepticon logos on this? They should have placed the decals exactly like the original, while leaving open spaces for customizers to place the Marlboro wording. Reprolabels wont touch anything named marlboor with a ten foot pole. It's like a dirty word for them. MR Optimus Prime wrote: But WHY put any Decepticon logos on this? It's a reference to the lampooned cigarette sponsor on the original. Smoking is bad, hence decepticon. Not to mention, the name exhaust evokes the idea of choking dark smoke. REALLY nice retooling of MP Wheeljack. I'm also glad to see that a Decepticon is getting the MP treatment. I think we need more Decepticons for this line. Bravo, Takara, bravo. Cyberpath wrote: Hm, why is this getting a new number? Sunstorm and Tigertrack didn't. Yet, Streak and Smokescreen did. My guess is the differing faction was enough to make him get his own number instead of being a mere special version of MP-20. I don't know if I'll bite on this one yet, but the more variants/retooled MPs that Takara sells means more money for them to seek out car company licenses for new MPs. Come on Porsche! Maybe this cigarette-themed MP means Takara won't be averse to giving us an MP Mirage? He's covered in cigarette company logos too. I don't begrudge squeezing a second MP toy out of the mold. In their position, I would do the same. However, Exhaust has officially displaced Tigertrack in last place on my Masterpiece priority list. Yikes.